Following the success of the Traidcraft sales at the school’s healthy tuck shop, members of the school council and prefects asked if they could organise a fairtrade sale and refreshments afternoon for parents during Fairtrade Fortnight. Publicity for the afternoon and the preparation (e.g. 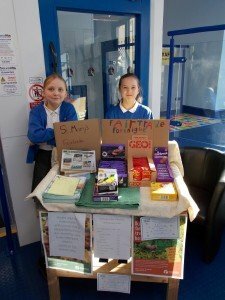 ordering the products and setting up the refreshments) was carried out by the pupils. The afternoon went very well and helped to raise the awareness of Fairtrade across our school community.